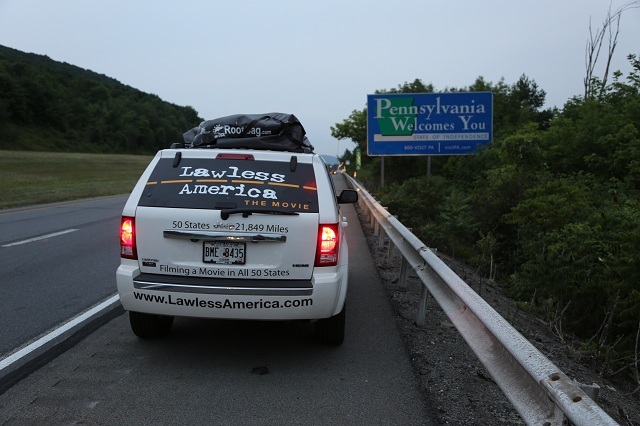 Bill Windsor and Lawless America went through Philadelphia several weeks ago, and the turnout was strong, but it is his return trip through central Pennsylvania, sad home of the “kids-for-cash” and Penn State/Sundusky scandals, and increased interest in Pittsburgh, that has expanded his itinerary in Pennsylvania. Bill himsellf has called the response through central and western Pennsylvania “HUGE” in his July 17, 2012 update. Approximately 40 witnesses (it is in the nature of a testimonial to Congress), most clients and former clients of Don Bailey, are currently scheduled to be filmed in Harrisburg, on July 21 and 22, 2012, and a third full day has been scheduled in Pittsburgh on July 23, 2012. The lists continue to grow. Margo Royer/Penn State case– Margo was a janitor in the mid-1990’s, working her way through school, and raising a daughter on her own, when she happened upon some “good old boys” who wanted her out. Her case has direct implications in the context of the Freeh report, and Margo’s saga, covering three decades, involves alleged freemason connections in the state and federal courts, and her courageous effort to fight against the Penn State climate for years. Julian Adams/Harrisburg City Police case– a lifelong resident of, and police officer for, the City of Harrisburg stood up against a racist police chief and a Mayor, Steven Reed of Harrisburg, who protected the clearly biased and prejudiced practices of the City. The conduct became protected by the federal court as well, and even Julian even experienced the Pennsylvania Human Relations Commission working against him. The Steve Conklin/mortgage foreclosure saga– what began as a dispute over arrearages led to Steve participating in exposing the nationwide fraud perpetuated by certain banking and mortgage institutions t cover up errors involved in the mortgage foreclosure crisis over the past decade. Steve was run through the York County courts, and his property taken without any hearing whatsoever, and the federal court was impotent in its responsibility to enforce this most basic constitutional mandate. The Thom Lewis case which led to the current Bailey discipline– Thom came to Don Bailey over efforts by certain pubic officials, including persons with the Pennsylvania Disciplinary Board itself, to interfere with and use his credentials as a successful collie rescue to illegally traffic in dogs in Pennsylvania. Before the complaint was even served, the disciplinary authorities were threatening Don, through his then-lawyer, Sam Stretton, to not go forward with the case. Don and Thom did, and the context foor this site was set. Miles Thomas and baron the dog and the harm caused them by the courts– in this case, an occasionally homeless man had his dog unlawfully taken by a roué Humane Society officer. He asked for it back, he was entitled to it back, and a federal court became the protector of the baseless effort to keep it from him. Angela and Johnny Robinson stand up against racist youth soccer coach– again a case involving racial bigotry in the City of Harrisburg, two parents of a young soccer-playing child became involved in an extensive campaign of retaliation for standing up against the teaching of messages of bigotry in the Harrisburg soccer program. The Robinson family was mistreated and abused by the defendants, even being suspended from the league entirely. They came to the federal court with the hope of justice, but the injury was only compounded, and a lasting negative lesson taught by the federal court, to their child. Centralia Pennsylvania coal fire case – the message of this case is simple – there never was a fire that threatened the entire Borough of Centralia, Pennsylvania. Centralia Borough is the owner of the mineral rights under the Borough worth perhaps billions of dollars, and the fire on the outskirts of town was used, as part of a long term intricate plan, by some connected attorney with access to the offices of several Pennsylvania Governors, to eliminate the Borough and secure the coal for their coal company clients. These are just a sampling of the cases that will be filmed these upcoming few days, and we will continue to bring you cases on a regular basis, as new forms of organization are developed. This effort is intended to create a network, for possible victims, lawyers, public interest groups, political organizations, and others, to work together to develop effective and meaningful ways to promote the equal access of justice to our courts, particularly in cases for the enforcement of the civil rights of all. We look forward to continuing to bring all of these matters to you.